There was just one item on the agenda at the Boca Grande Historic Preservation Society monthly meeting held on Wednesday, May 9, and the Board approved it unanimously. Many know it as “the house with the blue gate,” but the Historic Preservation Board called it 220 Park Avenue when it granted approval for a request that called for the demolition of an existing single-car carport at that location, as well as rehabilitation to the existing family residence, new fencing and upgrades to the pool. “This is a very large renovation of a building and other structures on the property,” said Lee County Planner Peter Blackwell. The applicant proposes to rehabilitate a single-family residence, to include the demolition of a wood-frame carport and replacement of previous additions, as well as replacement of the roof, siding and windows. The applicant also proposes to demolish an existing carport, reconfigure the pool and replace or install new fences. 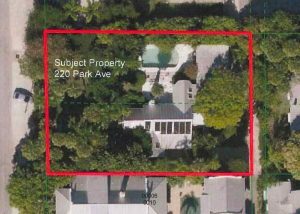 The subject property is a contributing site within the Boca Grande Historic District. “The south wing they want to replace is not part of the original historic parts of the building,” Blackwell said. The main structure will be raised about one foot to help alleviate problems with water deteriorating floors. The owner also wants to replace some existing fencework and install new fencing on both the west side, which faces Park Avenue, and the north side, which faces Our Lady of Mercy Catholic Church. Architect Tim Krebs brought renderings of what the residence would look like with a new carport installed, as well as what it would look like if the existing one is removed. Blackwell said the existing carport, which is deteriorating, actually sits on the County right of way. “We told them they can’t fix it; it must be moved or demolished, and we found it qualified for demolition under the required criteria,” Blackwell said. The new windows and siding will match the rest of the house. “The proposed new structures fit it quite well with the Boca Grande style.” Blackwell said. Staff reviewed the site plan and elevations and finds the project to be consistent with the Secretary of the Interior’s Standards for Rehabilitation and Land Development Code (LDC) Chapter 22. “Staff recommends that the Board make a finding that the proposed main residence rehabilitation, carport demolition, reconfigured pool and new fences are in compliance with the Secretary of the Interior’s Standards for Rehabilitation and Lee County LDC Chapter 22; and approve the special certificate of appropriateness for the subject property,” Blackwell said. At last month’s meeting, staff distributed a memorandum with a list of items that staff could potentially approve administratively instead of the items being scheduled for a public hearing before the Boca Grande Historic Preservation Board. The purpose of the handout is to initiate a dialog with the Board in preparation of amendments coming forth to Chapter 22 of the Land Development Code. The next meeting is planned for June 13. The agenda can be accessed online approximately seven days prior to the meeting. For more information, visit leegov.com.